AeroSafety World continues Flight Safety Foundation’s tradition of excellence in aviation safety journalism that stretches back more than 50 years. AeroSafety World, originally called Aviation Safety World, was launched as a full-color magazine in July 2006 and is now published 10 times a year. 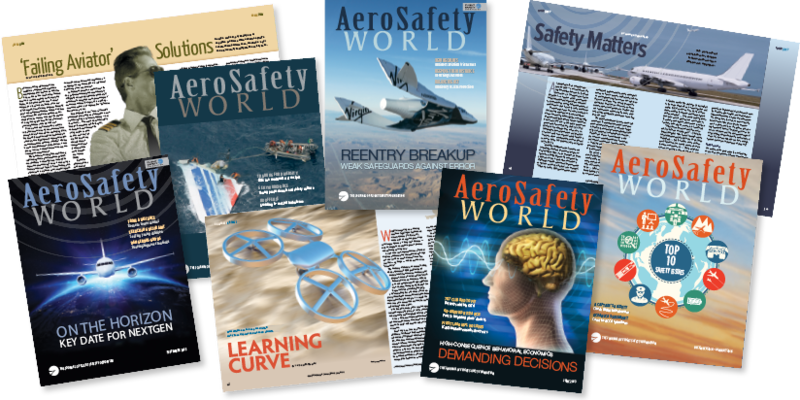 Effective with the November 2016 issue, AeroSafety World transitioned to a digital-only format, but continues to offer in-depth analysis of important safety issues facing the industry as well as a greater emphasis on timely news coverage. Archives containing the seven newsletters the Foundation produced before AeroSafety World was launched remain active and back issues of the newsletters are still available. See Publications for more information. Publishing a digital magazine, especially a high-quality one like AeroSafety World, is expensive. Members make all that possible. We feel they are entitled to some privileges. Members have online access to AeroSafety World immediately upon publication. The Foundation also offers ASW via a mobile app. The app is free to download, but you must be a Foundation member to login and view the content. If you are not already a member, we would be happy to welcome you as one. For more information please contact the Flight Safety Foundation membership department at; membership@flightsafety.org or phone; +1.703.739.6700, and ask for Louise Martin, ext. 112 or Ahlam Wahdan, ext. 102. In the interest of aviation safety and as an FSF member benefit, articles in this publication may be republished in printed or electronic form by members of the Foundation with the permission of Flight Safety Foundation. Articles may not be offered for sale or used commercially. All uses must credit Flight Safety Foundation, AeroSafety World, the specific article(s) and the author(s). Please contact Frank Jackman, editor-in-chief, AeroSafety World, for more information or for permission to reproduce or republish ASW articles. If you have an article proposal, manuscript or technical paper that you believe would make a useful contribution to the ongoing dialogue about aviation safety, we will be glad to consider it. Please email Frank Jackman, editor-in-chief. for more details. The publication staff reserves the right to edit all submissions for publication. Copyright must be transferred to the Foundation for a contribution to be published.